Logarithm of heat probability distribution. The peak is the average value. The circle marks the condensation threshold, which takes place to the left of the circle. 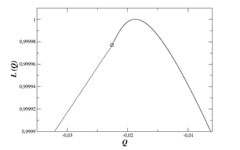 Equilibrium statistical mechanics provides general expressions for probability distributions from which thermodynamics can be deduced. A long-standing question concerns the possibility of describing by general principles also non-equilibrium fluctuations. Important progress in this direction has been made with the development of fluctuation theorems and macroscopic fluctuation theory for non-equilibrium steady states. However, fluctuations in non-stationary systems remain poorly understood. Recently, the off-equilibrium probability distribution of the heat exchanged with the thermal bath by a ferromagnet quenched below the critical point (a paradigm of phase separation and, more generally, of non-equilibrium aging systems) has been calculated analytically in an exactly solvable limit. Surprisingly, the distribution shows the existence of a singular threshold (see figure), beyond which fluctuations undergo a condensation transition. Namely, macroscopic amounts of heat are released to the thermal bath through a single microscopic mode. The mechanism driving this novel dynamical feature is reminiscent of the one underlying the Bose-Einstein condensation. The remarkable difference is that the Bose-Einstein condensation is about average properties, while in this case the condensation transition involves fluctuations remote from typical properties. The occurrence of this phenomenon in an out of equilibrium context still needs to be fully understood. From the explicit knowledge of the heat distribution a fluctuation relation, connecting the probabilities of released and absorbed heat, has been derived. This is the first analytical expression of this kind found for non-stationary systems. In this relation two characteristic energy scales appear, formally playing the same role of the reservoir temperatures in stationary fluctuation relations. The interpretation of these energy scales in terms of non-equilibrium effective temperatures and its consequences is an open question currently under investigation. The present article reveals the contribution of a little known Austrian physicist, Friedrich Hasenöhrl, to uncovering a precursor to Einstein famous equation in establishing the proportionality between the energy (E) of a quantity of matter with its mass (m) in a cavity filled with radiation. The author argues how Hasenöhrl’s work, for which he now receives little credit, may have contributed to the famous equation E=mc2. He believes the notion that mass and energy should be related did not originate solely with Hasenöhrl. Nor did it suddenly emerge in 1905, when Einstein published his paper, as popular mythology would have it. Given the lack of recognition for Hasenöhrl’s contribution, his original work on blackbody radiation in a cavity with perfectly reflective walls is examined. This study seeks to identify the blackbody’s mass changes when the cavity is moving relative to the observer. The reason why the Austrian physicist arrived at an energy/mass correlation with the wrong factor, namely at the equation: E = (3/8) mc2, are then explored. Hasenöhrl’s error would stem from failing to account for the mass lost by blackbody while radiating. 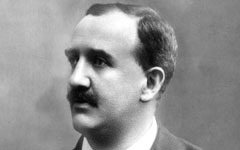 Before Hasenöhrl focused on cavity radiation, other physicists including French mathematician Henri Poincaré and German physicist Max Abraham, showed the existence of an inertial mass associated with electromagnetic energy. In 1905, Einstein gave the correct relationship between inertial mass and electromagnetic energy, E=mc2. Nevertheless, it was not until 1911 that German physicist Max von Laue generalised it to include all forms of energy. 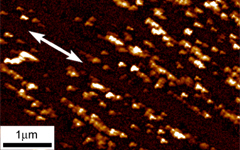 Left: TEM cross-section image of the FePt ESM media. White dotted line marks the interface between hard and soft phase. Right: Based on experimental findings numerical models used for simulation of the magnetic reversal behaviour. All dimensions are written in nanometres. The authors analyze the magnetic properties of strongly interacting hard and soft magnetic thin films: so called Exchange Spring Media (ESM). Such materials are characterized by a good thermal stability, while keeping the coercive field of the total structure below the value of the hard magnetic layer. 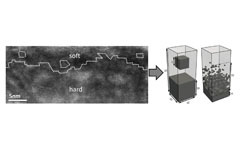 FePt hard/soft bilayers are used, of which crystallographic nanostructure is very complex, as shown by Transmission Electron Microscopy (TEM). 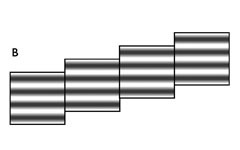 For instance, a rough interface between hard and soft layers is created with obstacles of one phase embedded in the second phase (Fig. left). 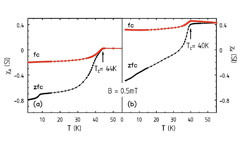 To understand how such a complex nanostructure influences magnetic properties of the ESM, the experimental phase distributions were transferred into numerical models (Fig. right) with which the magnetization reversal processes were studied using finite element micro-magnetic simulations. This analysis was supported by the analytical consideration of the magnetic pinning field (damping of the magnetization reversal). The combination of analytical and numerical approaches showed that observed nanostructures could significantly alter the coercive field of the media. For each distribution the coercive field minimum was found when nucleation field was equal to the maximal pinning field within the ESM structure. Moreover, the influence of the obstacles on the magnetic properties of the media was strongly restricted by their size and position within the material. The present model of magnetic properties analysis is general enough to be applied to other ESM materials, such as CoPt or FePt/FeAu hard/soft structures. 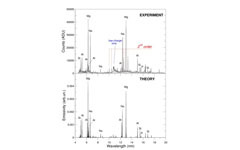 Comparison between experimental (5.93 keV) and theoretical (5.80 keV) spectra of highly charged xenon. Spectra of highly ionized xenon have been studied exhaustively in a wide variety of high-temperature devices, such as tokamaks and electron beam ion traps (EBITs), through the past several decades. Due to its large mass that significantly reduces the Doppler broadening, xenon is routinely used for spectra calibration, and therefore its accurately measured and identified spectra would have immediate application in diagnostics of hot plasmas. The measurements of extreme ultraviolet Xe spectra were performed on the NIST EBIT at six electron beam energies between 1.51 keV and 5.93 keV. These energies were chosen to enhance expected ion species based on our collisional-radiative modelling of the EBIT plasma. With a flat-field grazing-incidence spectrometer operating in the range 4.5-19.5 nm, we observed and classified 50 lines of Xe ranging from 26-times ionized to 43-times ionized. Thirty of these lines were entirely new, and eight of those are due to forbidden (magnetic-dipole and electric-quadrupole) transitions. By using well-known lines as references, we measured the wavelengths of the new lines to an accuracy of 0.0025 nm. 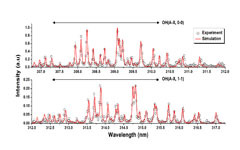 An example of agreement between the measured spectra and our large-scale collisional-radiative calculations used to identify spectral lines is presented in the figure. The theory is seen to be capable of correctly predicting not only the spectral line wavelengths but also their intensities. Schematic illustrations of the pining and de-pinning events of the fibrils in contact with a rigid sphere. A new model that could ultimately help robotic fingers made of a soft surface manipulate small objects is based on an understanding of how a ball stops adhering to a soft surface and starts rolling. Imagine a solid ball rolling down a slightly inclined ramp. What could be perceived as child’s play is here the focus of a serious theoretical work. The present study has one thing in common with childhood behaviour, it introduces a mischievous idea, namely studying the effect of random noise, such as vibrations, on the ball. It shows that it could lower the energy barrier to set the ball in motion. The authors used a ramp with a micro‐textured surface. This surface is akin to that of the gecko’s feet, made of so-called microfibrils capable of adhering to any surface by elastical deformation. They then studied the effect of vibration on a ball left on the top of such a textured ramp by subjecting it to a computer generated random vibration. The model shows that an activation energy is required to start the ball moving. It has been long known that the same applies to the adhesion of molecules, on a much smaller scale, as predicted theoretically by the so-called Arrhenius kinetics. This study pinpoints a finite threshold of intensity for the vibration noise above which the ball starts rolling. These findings could have implications, for example, for new MicroElectroMechanical systems (MEMs) based on robotic fingers that would be capable of displacing a small object and could be assisted by noise. Example of periodic repetition of a small system. This paper studies what can go wrong when computer simulations commonly used to model physical phenomena influencing molecular behaviour are applied outside their original context. It outlines the many pitfalls associated with simulation methods such as Monte Carlo algorithms or other commonly used molecular dynamics approaches. The context of this paper is the exponential development of computing power in the past 60 years, estimated to have increased by a factor of 1015, in line with Moore’s law. Today, short simulations can reproduce a system the size of a bacterium. The author outlines diverse examples of issues arising when seemingly simple simulation methods are not applied with the due level of care. For example, simulations of small-scale systems, such as cubic boxes representing a unit cell as part of a crystal or liquid crystal, display effects that are linked to the fact that the sample is of finite size. Therefore, these simulations can only imitate, not reproduce, macroscopic effects unless effects that occur at microscopic scale, such as surface effects, are effectively removed. The work also focuses on methods that, at first blush, appear reasonable, but are flawed and are akin to attempting to compare apples and oranges. For example, computing a mechanical property of a system—say the potential energy—using a Monte Carlo simulation, which can be based on thermal averages, does not allow to compute the thermal properties of such a system—such as entropy—in terms of thermal averages. Finally, the article also takes great care to debunk common myths and misconceptions pertaining to simulations. 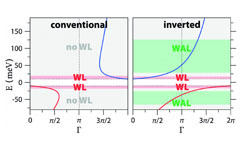 Berry phase Γ and corresponding weak localization (WL) and weak antilocalization (WAL) regions for transport in HgTe quantum wells. Topological insulators represent a novel class of materials featuring conducting surface states at the boundaries of an insulating bulk crystal. These surface states are induced by an inverted band-ordering, which arises if the states of the valence and the conduction band interchange their electron-hole character. In a Hall bar geometry fabricated from a two-dimensional topological insulator, the boundaries carry two quasi one-dimensional edge states with opposite spins and opposite propagation directions. Since both states carry a universal conductance quantum and backscattering between them is absent, the total conductance is quantized, which is known as the hallmark of the quantum spin Hall effect. For the first time, this quantized conductance was measured in heterostructures based on different HgTe and CdTe compounds, which exhibit a transition from a normal to an inverted band ordering for increasing HgTe layer widths. Reflectionless transport, and thereby the quantum Spin Hall effect, can also be explained by Berry phases inducing destructive interference of backscattered waves. However, this transport phenomenon can only be demonstrated if the Fermi energy can be tuned into the bulk insulating state. The present work shows that, besides the measurement of the quantum spin Hall effect, the different band orderings and the associated Berry phases of HgTe heterostructures can also be detected in the bulk conducting state by an investigation of the energy dependent magnetoconductance profile. Depending on the strength of the spin-orbit interaction and the chemical potential, the charge transport features characteristic transitions between weak localization and weak antilocalization, which are distinctly different for both band orderings and consequently introduce another way to verify the topological insulator properties. This paper describes how to synthesize a new material that belongs to the iron-selenide class of superconductors, called LixFe2Se2(NH3)y. This material displays promising superconducting transition temperatures around 44 K at ambient pressure, thus improving upon traditional copper-based high-temperature superconductors. The ultimate goal in developing such materials is to reach superconducting characteristics at temperatures above that of liquid nitrogen (77 K) to make them attractive for applications. Until now, superconductors based on iron and arsenic, discovered in 2008, worked at 56 K. As recently as 2010 attempts to develop other materials replacing arsenic with selenium yielded iron-selenium materials with an intercalation of potassium, rubidium, caesium or thallium. These materials, belonging to the family of iron chalcogenide materials, reached a superconducting temperature of 32 K.
The authors have now used a chemical synthesis method to intercalate lithium atoms between layers of iron and selenium. Similar to the way a cocktail would generate an exciting new flavour, stirring all these ingredients for several hours in liquid ammonia produced exciting new superconducting properties. 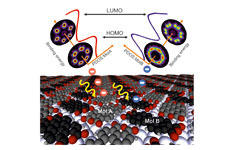 The properties are controlled by electronic doping and by expansion of the iron-selenium material’s lattice structure, which is gained by intercalating the lithium-based electronic donor molecules. The authors showed that these materials can be synthesised with a remarkable degree of purity. And the fraction of the material that is superconductive is almost 80%, the highest reported for materials in this family. Comparison of the experiment and simulation laser induced fluorescence spectrum of hydroxyl. Significant progress made in evaluating the density of active species used in medical applications of plasma physics could improve the accuracy of treatment: this article presents the first determination of the absolute density of active substances called radicals found in a state of matter known as plasma. These findings could have important implications for medicine - for example, for stimulating tissue regeneration, or to induce a targeted antiseptic effect in vivo without affecting neighbouring tissues. Laser fluorescence spectroscopy (LIF) is the detection method used to estimate the density of radicals in the plasma, made of charged species, active molecules such as radicals and atoms. The authors have chosen to focus on OH radicals because they are one of the most important reactive species in plasma science due to their high level of oxidation. This means that chemical reactions with OH initiate the destruction of harmful components either in the human body or in nature such as carbon monoxide, volatile organic compounds and methane.The problem is that, up to now, laser-induced fluorescent (LIF) capability to measure the absolute density of radicals has been very limited because of issues with registering and analysing the fluorescence signal. In this study, the authors present a simplified model which takes into account energy transfer stemming from the radicals’ vibrations. It can be used to analyse the LIF signal at regular atmospheric pressure. They then confirm the validity of their model experimentally, with a plasma jet made of Argon gas mixed with water molecules. An SSRM image of the (0001) surface of deformed GaN. 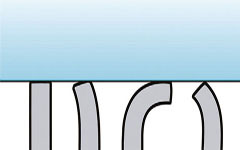 The arrow indicates the slip direction. Electrical conduction along dislocations in semiconductors has attracted much attention both from fundamental and practical viewpoints. Fundamentally, such dislocations can be one-dimensional electronic systems and their conduction mechanism has already been investigated. On the other hand, the issue of the dislocation conduction should be practically important because it might degrade the performance of semiconductor devices. Here, local current conduction due to dislocations in GaN has been studied by scanning spreading resistance microscopy (SSRM). Fresh dislocations, induced by plastic deformation, were used to see their intrinsic properties. The SSRM images showed many bright spots with high conductivity. The spots form chains along the slip direction and appear to be due to the edge dislocations introduced by deformation, which are terminated at the observed surface. Here, the line direction and Burgers vector of the dislocations are l =  and b = (a/3) [1 10], resp. Previous studies have shown that grown-in screw dislocations with l = b = c are conductive but that grown-in edge dislocations with l =  and b = (a/3) [1 10] are not, in contrast to our results. This apparent discrepancy should arise from the difference in the core structure between deformation-induced fresh dislocations and grown-in dislocations possibly decorated with native point defect or impurities. Theoretically, the electronic structures of the dislocations in GaN have been shown to change sensitively with the core structure, which should bring large conductivity differences. Local current-voltage spectra, measured at conductive spot positions, indicated a Frenkel-Poole mechanism for the conduction. These findings provide new insights into the issue of electrical conduction along dislocations in semiconductors. T. Yokoyama, Y. Kamimura, K. Edagawa and I. Yonenaga, ‘Local current conduction due to edge dislocations in deformed GaN studied by scanning spreading resistance microscopy’, Eur.Phys. J. Appl. Phys. 61, 1010 (2013). Schematics of the PTCDA/Ag(111) herringbone structure and a momentum space representation of its photoelectron angular distribution. The alignment of electronic energy levels at interfaces strongly influences the electronic properties of multilayer systems like, e.g., organic thin films. One very powerful technique to investigate this level alignment and determine electronic binding energies is angular resolved photoelectron spectroscopy (ARPES). This method also allows assigning the spectroscopic resonances to molecular orbitals, since the angular distribution of the photoelectron yield can be understood as a fingerprint of the orbitals in momentum space. So far the possibilities of this emerging concept have only been demonstrated for low symmetric surfaces and adsorbates with only few molecular orientations. This approach is extended to highly symmetric surfaces by studying the monolayer structure of the prototypical molecule 3,4,9,10-perylene-tetra-carboxylic-dianhydride (PTCDA) on the Ag(111) surface. This structure is particularly challenging since it contains two non-equivalent molecules per unit cell (Mol. A and B, see Figure) in six rotational domains, i.e., in total six differently oriented molecules of each type. However, the ARPES signal from both molecules could still be separated and an almost perfect match between the experimental data and the calculated moment space distributions was found for the highest occupied and the lowest unoccupied molecular orbital (HOMO and LUMO). Furthermore, the contributions of both molecules to the ARPES data were analyzed regarding their binding energy by a two-dimensional fitting algorithm called “orbital tomography”. The result, (experimentally obtained) densities of states projected on molecules A and B (PDOS), turned out to agree very well with scanning tunnelling spectroscopy results reported earlier. The present findings clearly indicate that even for complex surface structures containing many differently oriented molecules the orbital tomography technique allows reliable investigations of the electronic structure of individual molecular species in thin organic films. Lithium and Potassium are the only alkali species possessing stable fermionic isotopes, and as such, they have played a key role in the recent development of quantum simulation of strongly correlated systems using cold atoms. These two species also share an excited hyperfine structure hindering efficient laser cooling below the Doppler limit. In this work, we have implemented a laser-cooling scheme based on dark resonances, which allowed us to achieve record high phase space densities for laser-cooled 40K atoms. This strategy was initially developed in the early 90’s and relies on the existence of a family of so-called dark states in which the atoms do not interact with light and do not scatter photons. These states alleviate some of the detrimental effects of traditional schemes, such as spontaneous emission or multiple photon-scattering, which respectively limit the final temperature and density of “bright” optical molasses. This scheme is rather general and can be extended to other atomic species, such as Lithium, as demonstrated by preliminary results obtained in our group.